Today was absolutely fine. This evening the weather is even better. Feels nice and cool on the outside. The moon just adds to it. A setting made for the holidays. Most of today was cloudy to overcast with intermittent moderate showers, but it is really coming down outside tonight. Winds are constantly gusting and rain is pretty heavy. Satellite photos indicate a strong NNW to SSE line of thunderstorms just east of barbados. Looks like it will be a wet cool night. Well we are nearing the end of the 2003 Hurricane Season. Grateful it was uneventful for us in the lesser antilles and indeed the caribbean. 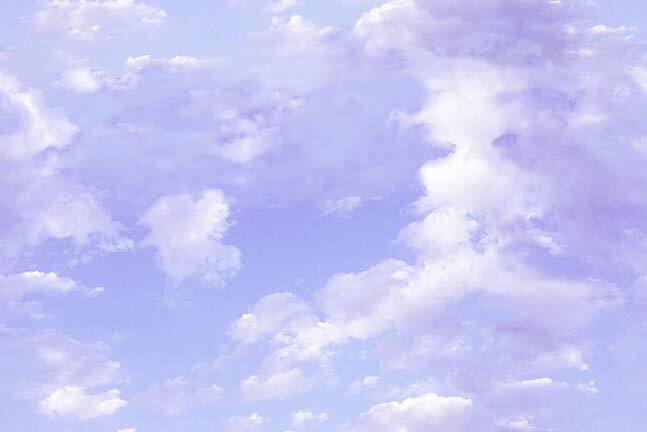 Its a nice day so far on the outside. 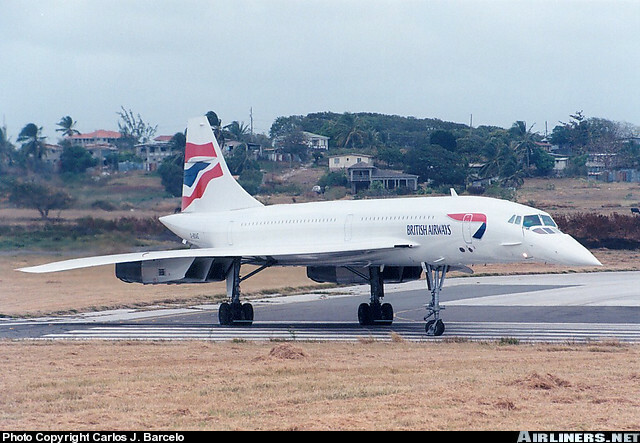 And before I leave, I must say how very happy I am to hear that Barbados will be recieving one of the seven BAC-Concordes which will be on permanent display near the Grantley Adams Airport. I am sure I speak for everyone when I say how honoured we are to recieve such an awesome beauty to make her home here. Even though forecasters still cannot pinpoint a center for Tropical Storm Nicholas, the entire envelope has been gaining in latitude. With no strong ridges to its north, it appear safe to say that the island chain seems to be out of harm's way. There is another depression forming behind Nicholas, around 590 miles south-west of the Cape Verde Islands but that will clearly be pulled rapidly north. Tropical Storm Nicholas, soon to become Hurricane Nicholas, is a system which the entire island chain has to pay careful attention to. What is interesting about this system is that generally, the majority computer models are handling it very badly and forecasters are unable to clearly identify the low level center using normal satellite information. It would be very instructive for those interested to read what is the public advisory and then the discussion by the forecaster which explains why he forecast what he did. In every discussion, what is striking is that the forecaster is discribing the great uncertainty and the strong possibilities of where the center might actually be but at the end of the day they are trying to maintain a consistency with previous forecast tracks so as not make an radical shifts. Its official. As of 11 pm T.D. 19 has been upgraded to the 14th tropical storm of 2003.
winds are 45 mph and movement at 295/9 or WNW. Meanwhile UKMET, BAM, GFDL, NOGAPS & GFS Models all seem to take Tropical Depression 19 WNW-NW over the next 48-72 hrs. I had a look at the RAMSDIS floater 1 loop about a half hour ago and it seemed to be only slightly nudging due N of W, While the bright yellows and red indicative of intense weather on infrared imagery, seemed to be flaring up quite abit. The NCEP are waiting for the system to break away from the ITCZ to name it. It is going to be interesting to see what happens to this one. As Mr. Ally said, this is very unusual weather for us here. I remember being right next to the Cable & Wireless building in Wildey last week around 7 pm, when there was a sudden intense flash followed milliseconds later by the loudest bang I've ever heard. That was the first time I have ever been so close to lightning. I almost jumped out my skin! It seemed to have struck the aforementioned building as the lights went of for a second or so. Today was no different. From here in Dover, I could see black cumulus towering far up into feathery cirrus patterns over to the west. Thunder and lightning commenced around 11 am. Only a few sprinkles around my immediate area though. The south-western section of the island was the scene of afternoon thunderstorms and flooding from heavy rains. The official forecast was for "scattered" showers. 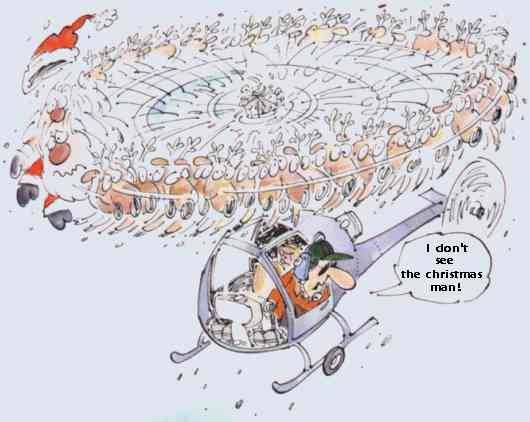 Guess they weren't scattered after all but became concentrated. Last week in Jamaica two cricketeers got hit by lightning and this evening in Barbados three or four people were also struck by lightning. This weather is uncharacteristic of the weather patterns in Barbados in recent years. Meantime ... some eyes are on TD #19/Nicholas. The National Hurricane Center is having a hard one with this system as are the models. Found one model run last night which looked like an octopus all twisted up. The models call for a WNW-NW movement but the entire envelope seems to be travelling westward. Be interesting to see how this shapes up this coming weekend. - ATLANTIC IN FULL BLAST! The latest visible satellite imagery shows Isabel's CDO expanding and NHC sets the wind estimates at 45 mph. This is at 2045 UTC. It will be both interesting and nerve-wrecking to see when this ridge gives way and Isabel takes that NW or N turn. I sincerely hope it does just that; heaven forbid on its way for Bermuda AGAIN!! But probably the most disturbing part of this Flare Up, is that I noticed another circulation pattern on that satellite picture just behind Isabel!!!!!!!!!! Just take a look! I wonder if thats Juan coming up? Its about 11:01 am here and all the wind that fabian was sucking in has returned to cool our otherwise hot island. 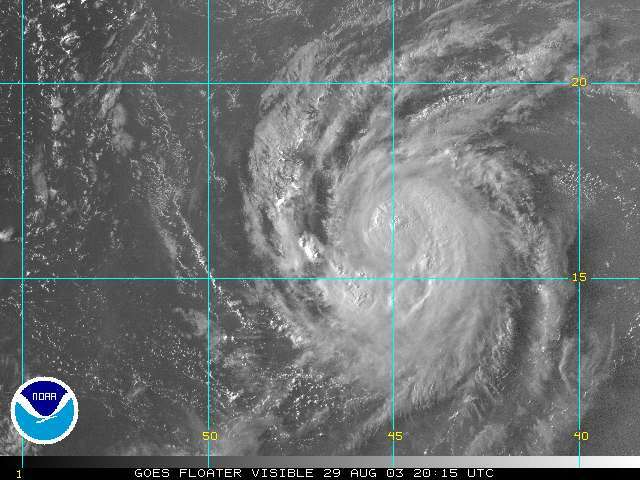 The folks in Bermuda are not so fortunate as Hurricane Fabian churns toward them. Looks like it will be a direct hit. Conditions are already deteriorating; last update I had it was just blowing spray and wind gusts to 60 + mph. I hope you and yours remain safe Terri. May God be with you all in Bermuda. Here in Barbados these last few days it seems to be getting hotter.... if that is possible - The sun is unmerciful and the humidity is intense. There are black clouds that just hang in the sky with no wind to move them anywhere. Occasionally we will have a quick fast downpour and then it stops. The ocean is just like glass...and the sun sets are fantastic. Like everyone else watching Fabian's path, as it moves North..
Certaintly an interesting day weatherwise . Immediately after watching the last British Airways Concorde departure from Grantley Adams International, my attention was diverted to the skies over St. Philip. There was a patch of very dark low level cloud over that area and what seemed to be a funnel cloud beginning to decend. It lasted for a minute of so and then dissipated. It seemed as though it was raining in that area too. Well apparently that was exactly what it was. A FUNNEL CLOUD!! The 5:30 pm news update confirmed it. However, although it rained heavily for about ten minutes in the six roads area, the funnel cloud/s never actually touched the ground. The officials at the Met. Office said that this type of weather phenomenon is to be expected during the hurricane season. Although I knew my eyes weren't decieving me, I was taken back somewhat to here the confirmation on the news. It is currently very hot and still on the south side of the island where i am located. 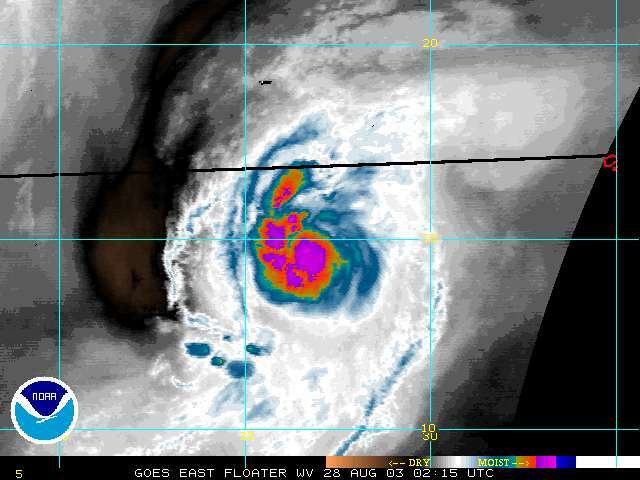 Meanwhile Hurricane Fabian as of 5:30 PM is a category 3 hurricane; Dangerous! For those who are wondering, the concorde's departure was spectacular!!! MILES...1735 KM...EAST OF THE LESSER ANTILLES. TOWARD...WEST NEAR 16 MPH. MAXIMUM SUSTAINED WINDS... 75 MPH. Newly formed Tropical Depression Number 10 as of 02:15 UTC. Computer forecast model runs indicate an eventual WNW to NW track, which should take this system well north of our friends in the leeward Is. I'm hoping it does just that. - rain, rain and more rain. Since last night, August 19, around 7 pm the rain has been falling almost consistently with periods of heavy rainfall. There was a brisk breeze also around midnight for an hour or so followed by a lull and then rains, thunder, and lightning started again around 5 am or so. Nice weather ... wish we had more days like today, but at las! About 8:45 a.m. the sky to the east grew very dark and rain started falling. >From my window which overlooks a valley and out to sea, nothing is visible. All is enclosed in the falling rain. Usually the rain falls on the east and south of the house but now it is also raining on the north side as well. Our streetlights have come on to compensate for the darkness. The wind is not strong at all. Tropical depression 6 could become tropical storm Erika within the next 24 hrs. At 4:55 P.M. the NRL Monterey Marine Meteorology Division has upgraded the strong wave along 44.5 W to tropical depression # 6. My guess is that other updates will be given anytime soon. the depression is approximately 1100 miles E of the lesser antilles and we should all keep a watchful eye on this system as it makes its way westward. At approx. 5:49 A.M. some strong thunderstorms drifted over barbados. Presently the weather is pretty intense with lightning, heavy showers, gusting winds and frequent peals of thunders that has the canines in the area going nuts. Satellites photos show a cell of intense weather just on our doorstep. Some rain clouds moved in from the east around 4:35 P.M. Presently overcast on the south coast. We did have some showers; the air is alot cooler now, thank goodness; today was a hot one. Just one tropical wave currently under investigation in the eastern atlantic along 36W. It does have a low level circulation along 9 N but surface pressures remain relatively high and convection disorganized. It remains, however, under investigation. We'll just have to watch it. All alerts off - just now at 6.00pm had a wicked down pour, with gusty winds. According to current satellite probably because we are at the outer band of the wave. Shouldn't last long. The rains that were supposed to start over Barbados yesterday morning did not materilize until around 7pm last night - then they came with a vengence - complete with thunder and lightening. The rains which were quite heavy at times along with the winds finished around 6.30 am this morning. The rest of the day has been threatening but nothing more has really fallen apart from the odd short shower.The skies at the moment are still grey and the winds are quite strong, but according to the satellite pictures the tropical wave has passed on.